The My Schedule is available from the Home Page. It is a list of all players' data that has already been entered or scheduled. Any entries or events entered for the group of players that you are currently viewing appear on the "My Schedule" page. 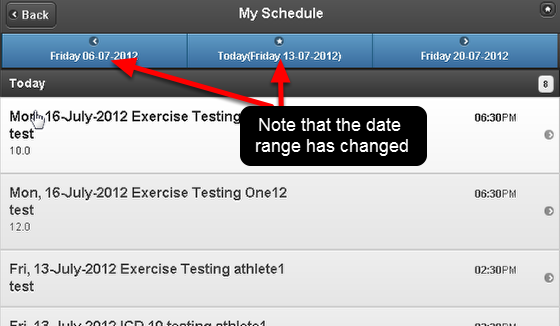 The My Schedule shows you the data which has been entered, or is scheduled, in a Schedule List view. 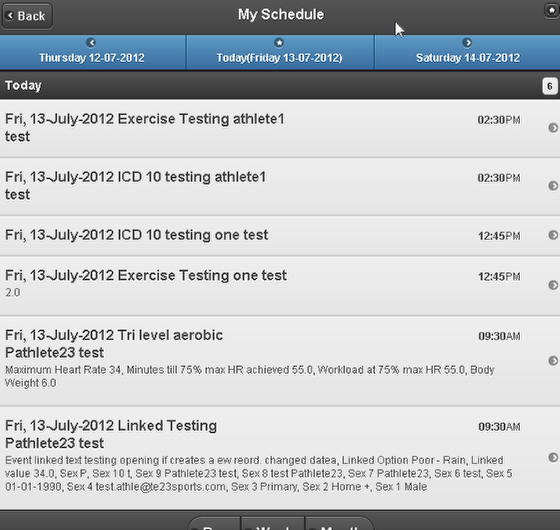 The image here shows the My Schedule view on the iPhone. 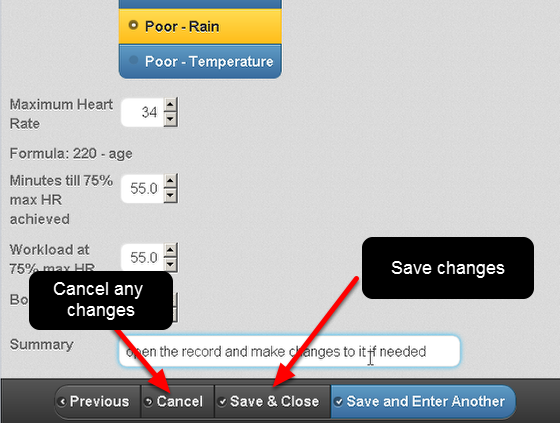 Any entries that appear on the My Schedule Page can be clicked on and opened. Once opened you can see all of the data that has been entered for that Event. 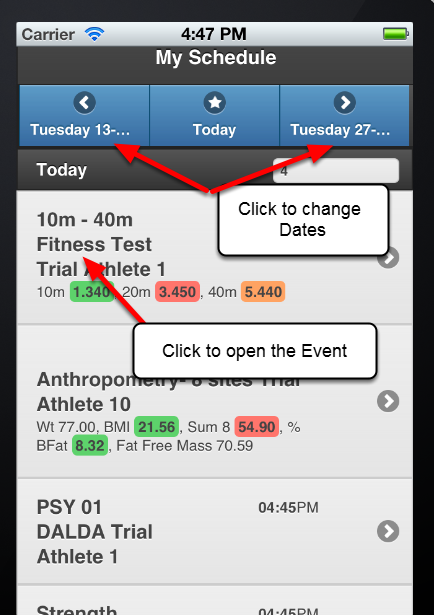 It will display in the same format as reviewing an Event Form from the My History Page. 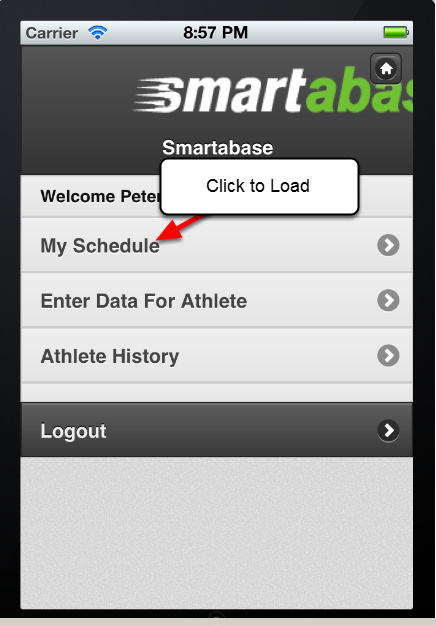 When you first login and view the My Schedule Page, ONLY the entries that have been entered or planned for the date that you are logged in on will be displayed. Sometimes when you load your My Schedule page it may be completely empty because no events are planned/entered for today's date. To see if other data is entered for different dates, click on the correct Date Period to display data entries by day, week or month. 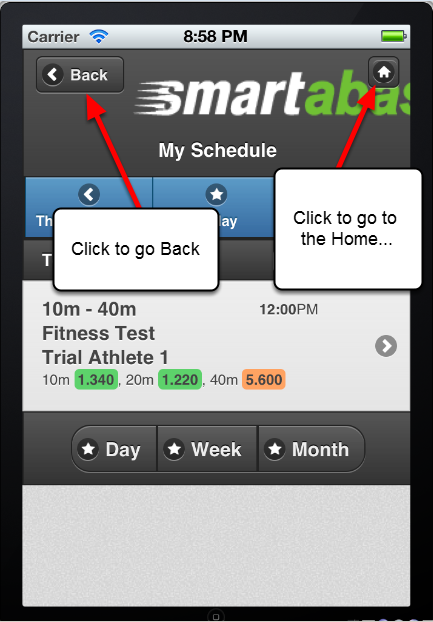 The example here shows a "Week" view. The week view now displays data from a Monday-Sunday. The Month view displays data from the start of the month to the end of the month. To go back to the Home Page, click on the Back button. Or, click on the Home Page icon to go directly to the Home Page from any page on the application.